Slice the chorizo thickly on the diagonal. Drain the beans and rinse. Fry the chorizo in 1 tbsp olive oil until it crisps a little on the edges. Add the beans, stock or water and 1 tsp paprika. Simmer gently while you prepare the rest of the dish. Prepare the mayonnaise by beating in the paprika, saffron, salt and pepper. Add lemon juice to taste. Cut the squid tubes into 1cm rings, and the 'legs' into smaller sections. Mix the flour, salt, pepper and remaining paprika in a plastic bag. Toss the squid in the flour, shaking off any excess. Heat the remaining 3 tbsp oil in a pan until hot. Fry the squid in batches, turning once. Drain on kitchen paper and season. 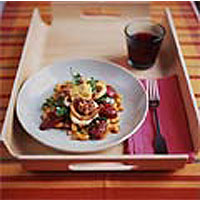 Divide the beans and sausage between four warmed plates, scatter with rocket and arrange the squid on top. Serve with lemon wedges and the paprika mayonnaise.